J orn Lier Horst’s Dregs acquired a number fans when it was published in 2012 including Maxine Clarke at the Petrona blog. 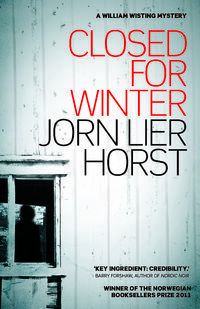 It is sad to note that Lier Horst’s second book to be translated into English, Closed for Winter, has been submitted as an entry for the 2014 Petrona Award for Translated Scandinavian Crime Fiction which was set up in Maxine’s memory. Dregs picked up the story of police inspector William Wisting more or less mid series and the publishers have made the wise decision to translate the books forward from this point so that there is continuity in the narrative. Ove Bakkerud arrives at his summer cottage in the middle of winter to discover that it has been ransacked after a burglary. Checking the neighbouring properties, he discovers the body of a man beaten to death. William Wisting investigates the case which is complicated by the presence of his daughter living in a cottage near to the scene of the murder. When more deaths follow, he travels to Lithuania to follow the trail of what is clearly more than a burglary gone wrong. Lier Horst has recently retired as a senior investigating officer in the Vestfold police district. As in the previous novel, his experience in investigating crime comes through clearly on the page and the reader is often treated to small snippets of why the investigation proceeds in a particular way. This makes for a solid police procedural with a strong emphasis on the method by which crimes are solved. Wisting is an attractive character, grieving for his dead wife but happy with a new partner. His relationship with his journalist daughter, Line, which was one of the highlights of Dregs, is explored further here. I wasn’t was enamoured of the ending as some other reviewers but overall the book was an excellent read. I’m looking forward to hearing more about the series when Lier Horst speaks at the Iceland Noir event. Thanks to Sandstone Press for my review copy. The translation was by Anne Bruce. Am very much looking forward to reading Closed for Winter, Sarah. Thanks, Jose. I’ll be interested to hear what you make of the book. Sarah – Thanks as ever for an excellent review. I like the William Wisting character very much too, and it’s good to hear that this novel also weaves his relationship with Lise into it. I enjoyed that aspect of Dregs very much. Yes, me too Margot. The relationship definitely rings true. It is set in Norway, Moira. Perhaps I should have made this clearer in my review. There is a wide range of Norwegian crime fiction out there for you to enjoy! I read your review of Dregs just now also, and am now torn. The series sounds good but not sure I like starting in the middle of a series. I do agree that it is best to keep going forward for continuity, but maybe they will cycle around someday and get all of them. Since I have so much to read now, including lots of Scandinavian series I haven’t started yet, maybe I will hold off on this one and see. Or not. It is very tempting. It *is* very tempting, Tracy and I hope you do start with Dregs which seemed to be universally liked here. What’s the deal with “The Hunting Dogs”? I thought the English ebook would be out on iBooks this week? I don’t know I’m afraid. I know the print version has come out in the UK but I’m not sure about the e-book.